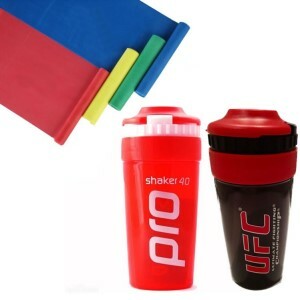 Buy 2 Shaker Pro protein shake mixers and get a Free Body Concept 1.2m resistance band! If you want a portable training buddy the Body Concept resistance body band is a must-have in your home gym, at work or travelling. Wherever you are, this is the perfect weapon to workout out all major muscle groups and enhance muscle tone. Whether you're strengthening your muscles in your coffee break to prevent muscle tension, using it to assist in rehabilitation following injury, training up in a group or taking your fitness with you on holiday, this is the ultimate body band.